The global financial crisis and sovereign debt crisis exposed the inadequacy of European economic governance. Despite the multitude of new mechanisms and institutions that have arisen over the last few years, many contend that economic governance remains inadequate and the EU must integrate even further to calm still-volatile markets. A tension exists between creating effective instruments that will not overstep the authority delegated to an EU that has integrated economically but not politically. Can the EU’s economic governance system satisfy the demands of markets and politics? Relevant issues include the ability of supranational institutions to dictate policy to national governments, the harmonization of economic policies and institutions across Europe, and a substantial increase in the transfer of funds across borders. Can monetary union continue without political union? How will the new institutions alter the distribution of power between EU institutions as well as between member states? This edited volume analyzes the major policy challenges and institutional mechanisms at the EU- and international levels to combat the global financial crisis and the EU’s sovereign debt crisis such as financial integration, fiscal cooperation, and the rising power of the ECB. This book was published as a special issue of the Journal of European Integration. 1. Introduction: Kicking the Can Down the Road to More Europe? Salvaging the Euro and the Future of European Economic Governance 2. Sworn to Grim Necessity? Imperfections of European Economic Governance, Normative Political Theory, and Supreme Emergency 3. ‘Tough Love’: How the ECB’s Monetary Financing Prohibition Pushes Deeper Euro Area Integration 4. Time Will Tell: The EFSF, the ESM, and the Euro Crisis 5. Fiscal Policy Coordination and the Future of the Community Method 6. The Politics of Risk-sharing: Fiscal Federalism and the Greek Debt Crisis 7. The EMU’s Legitimacy and the ECB as a Strategic Political Player in the Crisis Context 8. The Little Engine that Wouldn’t: Supranational Entrepreneurship and the Barroso Commission 9. 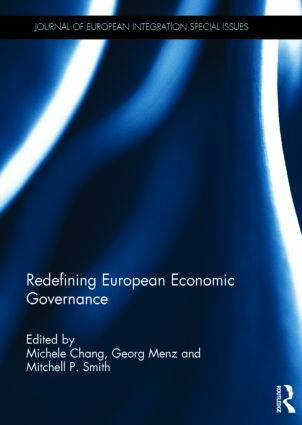 Merged Into One: Keystones of European Economic Governance, 1962–2012 10. Banking on Stability: The Political Economy of New Capital Requirements in the European Union 11. Keeping the Agents Leashed: The EU’s External Economic Governance in the G20 12. Eurozone Crisis and European Integration: Functional Spillover, Political Spillback? Michele Chang (College of Europe), Georg Menz (Goldsmiths University of London) and Mitchell P. Smith (University of Oklahoma) are former co-chairs of the European Union Studies Association’s Political Economy Interest Section. The Journal of European Integration book series is designed to make our Special Issues accessible to a wider audience. All of the themes covered by our Special Issues and the series are carefully selected with regard to the topicality of the questions addressed in the individual volumes, as well as to the quality of the contributions. The result is a series of books that are sufficiently short to appeal to the curious reader, but that also offer ample depth of analysis to appeal to the more specialist reader, with contributions from leading academics.